Fujitsu Limited,Lenovo Group Limited,Development Bank of Japan Inc.
Fujitsu Limited ("Fujitsu"), Lenovo Group Limited ("Lenovo") (HKSE: 992) (ADR: LNVGY) and Development Bank of Japan Inc. ("DBJ") today announced a strategic collaboration that creates a joint venture between the three companies. The joint venture will focus on the research, development, design, manufacturing and sales of Client Computing Devices (CCD) for the global PC market. Fujitsu will sell a 51% stake in its wholly owned subsidiary Fujitsu Client Computing Limited ("FCCL") to Lenovo and a 5% stake to DBJ. After the transaction, FCCL will become a joint venture company ("JV") owned by Fujitsu, Lenovo and DBJ and will continue to be known as Fujitsu Client Computing Limited. The transaction is expected to be closed in 1Q FY2018. The aggregate consideration received by Fujitsu will be JPY 28.0 billion (approximately HKD1.9 billion) that includes JPY 25.5 billion from Lenovo and JPY 2.5 billion from DBJ(※). After the transaction, Kuniaki Saito, the current representative director and president of FCCL, will assume the role of Representative Director and President of FCCL. 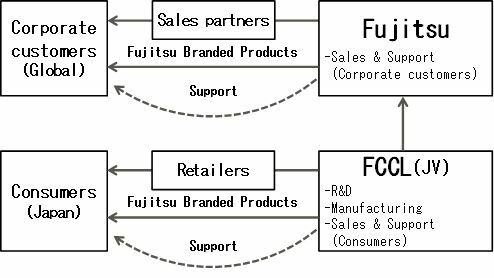 After the JV is established, FCCL products will continue to be distributed and sold under the Fujitsu brand name. Fujitsu will continue to serve corporate customers worldwide directly or indirectly through its valued channel partner network and provide the related after-sales support and services. FCCL will serve the consumer market in Japan either directly or indirectly through mass retailers and provide product support and services. Through this strategic collaboration, Fujitsu and Lenovo aim to drive further growth, scale and competitiveness in the PC businesses both in Japan and worldwide. The JV will leverage Fujitsu's capabilities in global sales, customer support, R&D, highly-automated and efficient manufacturing and systems integration that meet customers' demand. Furthermore, it will benefit from Lenovo's global scale and presence. Through investment in JV, DBJ will support FCCL's sustainable growth and provide financial expertise from the perspective of a financial institution. Fujitsu will continue to offer a high-quality, innovative, secure, and reliable Fujitsu branded CCD portfolio to its corporate customers worldwide, contributing to their digital transformation journey, and co-creating the workplace of the future by integrating PC offerings with Technology Solutions. (※)The actual consideration could be adjusted from the above-mentioned figures based on FCCL's balance sheet at closing date. 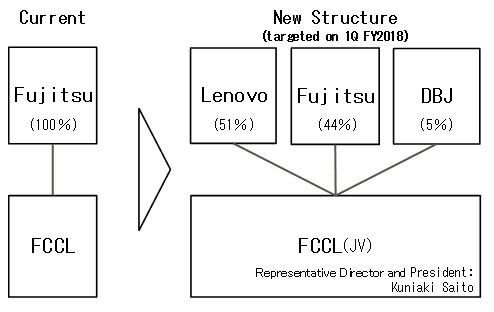 The initial consideration from Lenovo will be JPY 17.85 billion and will be adjusted upwards based on FCCL's future business performance. DBJ is a 100% Japanese government-owned financial institution headquartered in Tokyo, Japan. Since the establishment of its predecessor, Japan Development Bank in 1951, throughout its history, the bank has been devoted to regional development, environmental conservation, basic social infrastructure, and the creation of technology and industry. With the customer-oriented innovative solutions drawn from its unique integrated business model of investment and loans, DBJ aims to promote joint risk capital-financing with business players, financial institutions and investors for the creation and promotion of the growth capital market.